Beekeeping is a truly ancient craft – all over the world and for thousands of years man has invented means of harvesting the precious sweetness of honey. In Europe the Greeks produced the earliest writings about beekeeping, followed quickly by the Romans. In England we have a long history of handbooks written by beekeepers, starting about 1500, and including the earliest published by a woman – “The Queen-like Closet” by Hannah Wolley in 1670. Our own club has more recent origins, initially as the Eltham branch of the Kent Beekeepers Association. There was a surge in beekeeping during the 1914 / 18 Great War, when food was short, but this subsided in the 1920s and the ‘long term’ keepers found it difficult to maintain interest in visiting each other’s apiaries and homes. In 1928 a collective or co-operative apiary was established, owned jointly by a number of the local beekeepers, financed initially with the princely grant of £3 from branch funds, and then in 1929 by share subscription. It was also equipped in part with spare hives etc from founder members, which proved a mistake. The many different kinds of hives and other equipment proved difficult to work, and eventually this could only be solved by new equipment. But in spite of this, at the close of the first season, a dividend equal to 20% was paid, calculating honey at the then reasonable price of 1/3d (8p in today’s money) per lb. And this from only 4 stocks! So the venture proved a great success, first on a site opposite Small Gains Farm on Maidstone Road, and then moving across to Small Gains farm itself. Good crops of honey continuing to provide revenue, and the teas provided in the apiary pavilion on a Saturday afternoon soon became renown. The members’ interest in the Apiary and it’s management also had a positive effect on the winter meetings of the branch. Another major war in 1939/45 once again brought a lot of new members to what was by then known as the Sidcup Branch of the Kent Beekeepers’ Association, but only one active member remained of the original apiary founders, Mr P.C. Thornton. The fixed assets, worth about £100 were presented to the new Ruxley Apiary Club, and in March 1946 it started with 96 members, six stocks of bees, and the indefatigable Mr Thornton as president. The results beat the original venture by paying a 50% dividend its first year! It must also have been the most economical social club of all time, with one 25p subscription lasting a lifetime (so long as Sidcup Branch annual subscriptions were paid). In the late 1980s the Ruxley Apiary moved again, this time a few hundred yards down the hill to its present location at Honeydale Farm, Maidstone Road, Sidcup. In the mid 1990s, the Ruxley Honey Co-operative was set-up to help with the sale of the honey produced by the Apiary and by members. In 2005 it was necessary to modernise our arrangements to comply with Charities Act rules, so after a lot of soul searching, the decision was taken to abolish the semi-autonomous position of the Ruxley Apiary and to incorporate the Apiary fully into the Sidcup Branch of the Kent Beekeepers’ Association. Then, in 2007, members voted to abolish the distribution of the dividend, which for many years had been set at a token 1lb of honey, since there was no longer any need for members of the Sidcup Branch to buy shares in order to benefit from Ruxley Apiary activities. At this time greater awareness of environmental matters amongst the general public, and the importance of honey bee pollination, meant that membership was growing rapidly, and Ruxley Apiary was too small to cope properly with numbers wishing to participate each week. 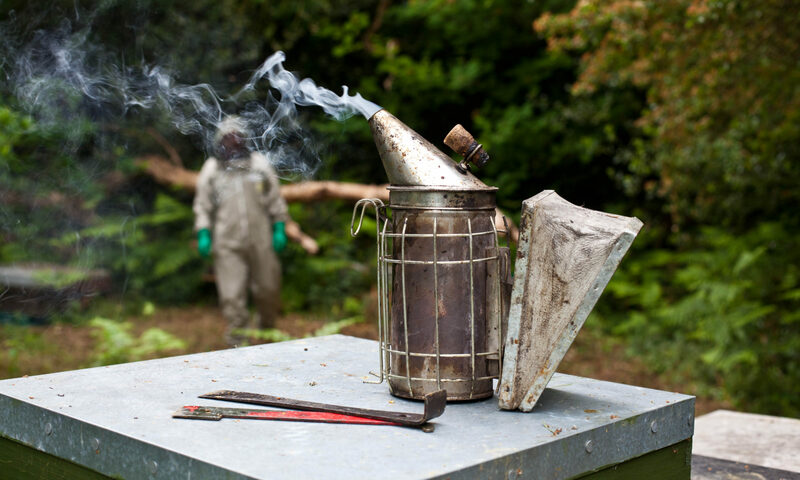 After extensive searching with the active assistance of Bexley Council officials, a potential site was identified in Baldwyns Park and in 2008 arrangements were agreed with the Baldwyns Park Freeholders Association to set up an apiary in a derelict part of their grounds. After a lot of hard work clearing the site, a very generous donation by our longest serving member Cliff Ingram enabled us to build a substantial apiary workshop to complement the excellent club house facilities of the BFA. So by 2016 we have over 70 active members, and about a dozen or so colonies are maintained in each apiary for teaching purposes and for honey production. Since members work in the apiary for free, this means our finances are in reasonable shape to meet the challenges ahead. Interest in bee related things amongst the general public remains high, as does the increased awareness of environmental matters, and the vital role played by bees in healthy, successful agriculture (and gardening) is probably better understood now than it has been for many years. Both Ruxley and Baldwyns apiaries continue to maintain the reputation for their members’ Saturday afternoon tea and cakes.